We started with an initial consultation, then headed over to the office to get a feel for the opportunities within their space. Bare walls, large glass offices, entryways, and windows all provided great canvases to nurture visual corporate culture. We then let our team of graphic designers and installation experts put together a branding blueprint that would make their office shine. OTIS is the name when it comes to elevators, moving walkways, and escalators. Founded in 1853, the company has continuously made a name for itself by being a pioneer in the vertical transportation business. They’ve installed elevators in famous buildings across the world - including the Eiffel Tower, Empire State Building, Burj Khalifa, CN Tower, and just about every skyscraper out there. Chances are if you’ve been in an elevator, moving walkway, or escalator, you’ve been transported by OTIS. 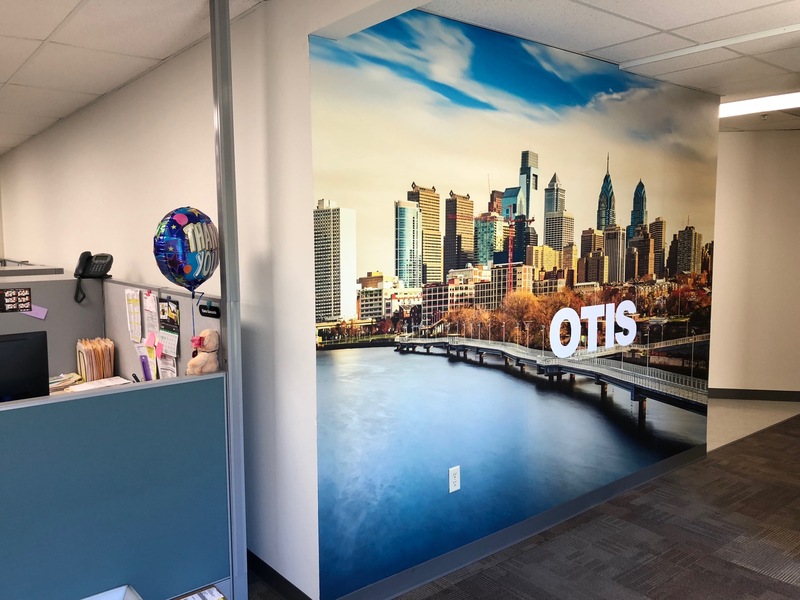 On these deep historical notes, OTIS came to Sunrise Signs looking for help realizing their branding goals at their Moorestown, New Jersey office. They wanted to revitalize their space and incorporate corporate culture elements to create an impressive visual space for their employees and visitors. We were happy to help! "The plan was to create an office brand alignment that highlights the legacy of the company and it's years of influence in the elevator industry. A mixed use of their "retro" and new logos to create a bridge that subtly nods to the years the company has been in business." First impressions are essential - and at OTIS you'll be greeted by this stunning custom printed wall mural. Our designers curated the graphics and enhanced them to create a clean image that pops off the wall. The Philadelphia skyline helps visually communicate the local residence of the office and the culture of the metropolitan area. Our installation experts applied the mural directly to the wall, using a special-made wall adhesive vinyl. OTIS had a row of offices along their wall which provided a great opportunity to support their internal branding. 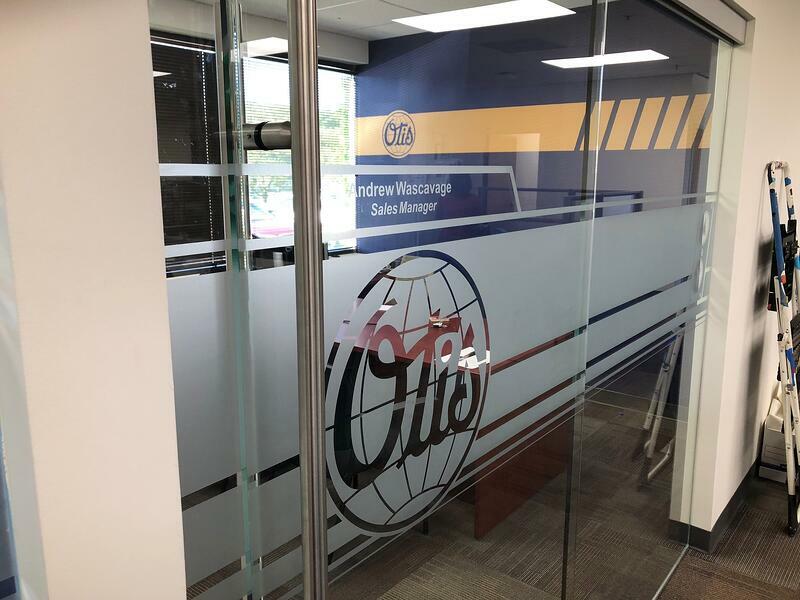 We added a taste of class, legacy, and privacy to several glass features of the OTIS office using a custom cut privacy film. Our graphic artists incorporated the company's retro logo, clean lines, and an elevator button into a smooth design for office doors. 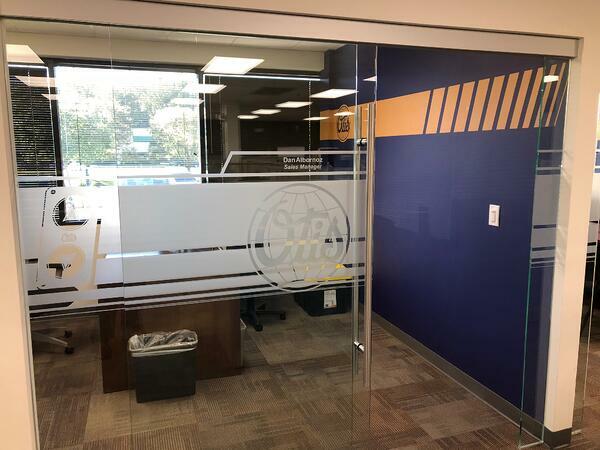 These new graphics help align the office branding while providing some polite privacy along the way. The walls of OTIS provided a great canvas to help solidify the new corporate culture we were helping to create. These wall graphics are the glue that holds the project together. 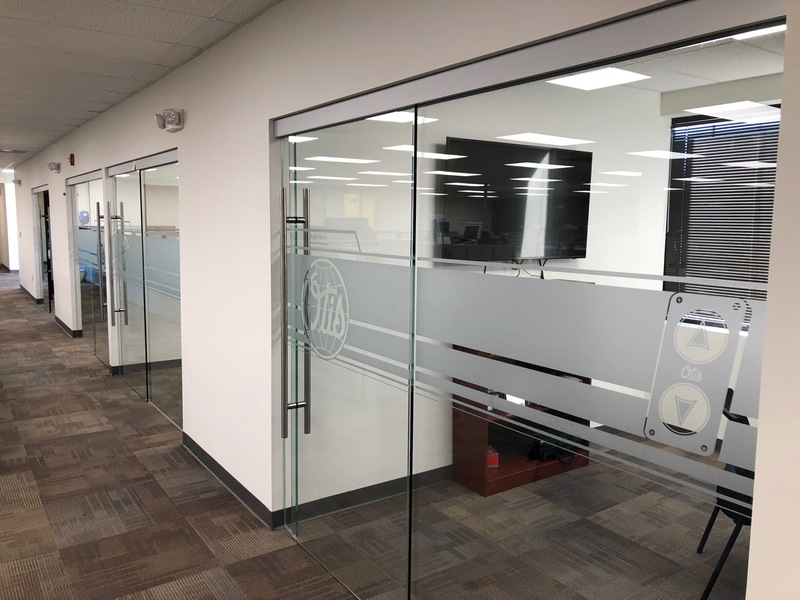 Their use of the retro logo and clean lines add visual signposts around the office to add consistent reminders of the culture and company brand to visitors and employees. When the project was complete, OTIS had a new branded environment workspace with a strong sense of corporate culture. Their walls and offices now work together to create a clean retro feel that elucidates the legacy of the company. Visitors and employees now have a little more comfort and confidence in a professionally branded office. We're ready to take your office culture to where it needs to be. Let's have a discussion about how we can help add smart interior branding to your workspace. Office murals, privacy film, 3D lettering, accent walls, lettering - we've got you covered.